Tucked into a small Glenora strip mall, Vi's for Pies has an unassuming exterior that is easy to drive past without noticing. Well, it was time for me to pull over and check it out. A few steps from the entrance is a display case containing their specialty: homemade desserts (including fruit pies, mousse pies, and cheesecakes). Though I hadn't eaten dinner when I arrived, I was contemplating jumping straight to dessert I lingered at the case before being seated. When I eventually tore myself away and made it to a table, our waitress carried a menu, handwritten on large chalkboard over to our seats. Though constrained to the dimensions of the board, the menu was quite varied with soups & salads, bunwiches, barbecued meats, and hearty entrees. Since we were at a pie shop, the chicken pot pie was an easy dinner choice for me. 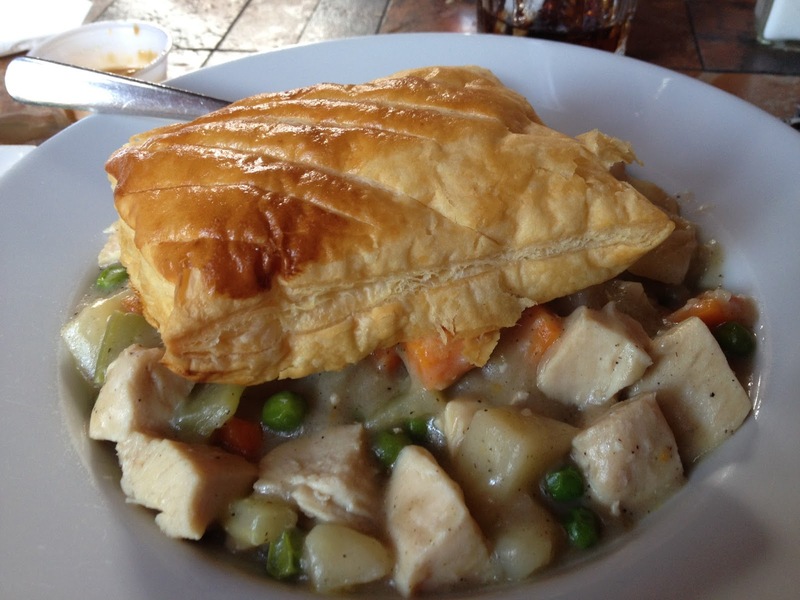 It arrived fairly quickly, with a buttery pastry sitting atop a mixture of white meat chicken chunks, peas, potatoes, and carrots coated with a savoury chicken gravy. The dish was simple, comforting, and very easy to enjoy. Certainly worth coming back for on a cold fall night. A pork chop was on special that evening. But it wasn't just any pork chop. 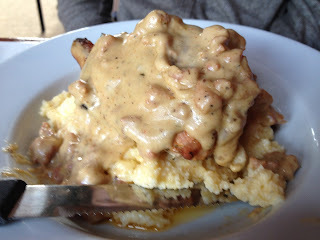 This chop was stuffed with corn bread and spicy andouille sausage, accompanied by cheesy grits, and drenched in pan sauce. The dish was packed a moderate punch of heat, and tons of flavour, while still firmly sitting in the comfort food category. It's unfortunate it's not on the regular menu, as these are my favourite kinds of dishes! The dinner portions were quite generous, and we wound packing up about half of each dish to take home, and it's a good thing we did. Dessert at Vi's is not to be missed. My guest opted for the chocolate almond coconut mousse pie. 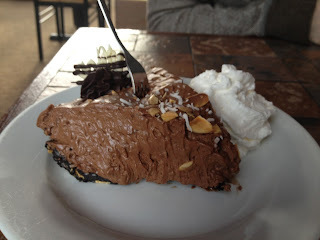 Chocolate flavour dominated the pie, with just a hint of coconut mixed throughout. When I asked my guest about his thoughts on the pie he looked up at me, mouth half full, and said "amazing," before going right back to eating. Good sign. 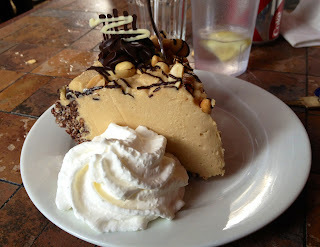 Vi's peanut butter mousse pie was an incredible experience. If the smooth, creamy, rich peanut butter mousse filling weren't delicious enough, the chocolate rice crisp crust will send you on a brief trip to heaven. If you're looking for out-of-this-world desserts, you will certainly find them at Vi's for Pies. But that doesn't mean you should overlook the rest of the menu. I found all the dishes I sampled during our visit to be fresh, well-prepared, and tasty. 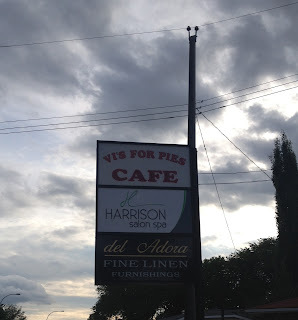 If you're on the lookout for a homemade, comforting, and delicious meal from start to finish, give Vi's for Pies a shot. Plow and Harvest is a new restaurant that will be opening in Edmonton on August 16th. I am a sucker for a hearty, comforting meal, so when I learned of Plow and Harvest, and their mission, to redefine comfort food, a few months ago, I was certainly intrigued. With opening day approaching, I was contacted by the restaurant's team about a giveaway for tickets to their sneak peek tasting on August 13. To enter the giveaway, simply enter your name and email in the widget below to enter. Tweet about the giveaway for an additional entry. The contest closes at 12am on August 8. Edit August 8: The contest is now over and the winners have been contacted! Congrats guys and enjoy the event!